Jackson has started an infatuation with these magnetic trains. He plays and plays with them all day long and refuses to stop until he is so exhausted he simply passes out. Grandma Karen has the biggest stash of these train pieces and he spends A LOT of time down at her house playing with them. He fell asleep standing upright in the middle of his train play. Maybe next time we should just put the track in bed with him. He does love the trains right now. When I was there on Saturday I don't think he left my parents house the whole day. My mom loves it and it's probably not to bad for you either. That is a hilarious picture!! I love that picture!!! 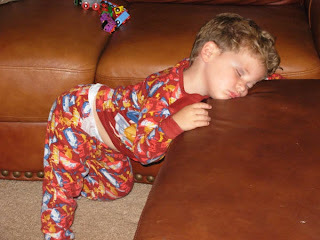 Funny sleeping positions of children are the BEST! I love it! That must be what she was talking about today when she said she had a new friend. That's too cute. That's a great Kodak moment!